The Beatles For Jazz Piano by The Beatles. Arranged by Steve Hill. For Piano/Keyboard. Piano Solo Personality. Classic Rock, Britpop and Psychedelic Rock. SMP Level 5 (Intermediate). Collection (no lyrics). Chord names (does not include words to the songs). 48 pages. Published by Hal Leonard (HL.306121).ISBN 0793570492. With chord names (does not include words to the songs). Classic Rock, Britpop and Psychedelic Rock. 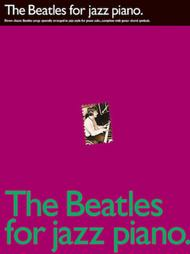 9x12 inches.11 classic Beatles songs specially arranged in jazz-style for piano solo...complete with guitar chord symbols. Songs include: All My Loving * And I Love Her * The Fool on the Hill * Here, There and Everywhere * Michelle * Yesterday * and more.This title has selections that range in difficulty from SMP Level 4-5.About SMP Level 5 (Intermediate)Seventh chords and melodies in both hands. More difficult note reading with ledger lines above and below the staff.